Display : Single display: 7 segment, 4 digit, 0.56”, RED LED display. Features & Specifications :Display Type : LEDDisplay Configuration : 6 digitsOutput Contact : DP..
PVC box with 1P MCB, 03 connectors, Digital temperature controller and wiring.. Features :Display : 7 segment, 4 digit, 0.56”, RED LED display.INPUT : Sensor : J / K / PT-100 2W/3W.. 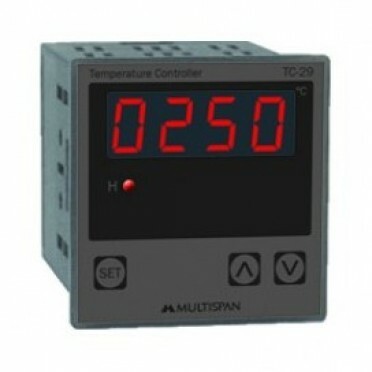 Features :Display : 7 segment, 4 digit, 0.4”, RED LED display.INPUT :Sensor : J / K / PT-100 2W/3W (.. Specifications :SENSOR INPUTJ,K, RTD, PT-100 (OPTIONAL)TEMP. CONTROL SETTINGBy Dial Type KnobSENSOR ..